This morning I turned on my iPad and opened up the App Store, to find the long awaited iBooks update has become available for not only the iPad, but the iPhone and iPod Touch. Personally I think it’s a very important update for Apple, and their quest to validate the iPad has a true eBook reader. Obviously the update is coinciding with the release of iOS4, making any iPhone or iPod Touch running the new iPh0ne operating system, capable of using Apple’s ebook app. iBooks version 1.1 incorporates some important and cool new features. The biggest feature being .PDF support. This finally makes the iBooks and the iPad are real ebook reader. Up until now, iBooks only used epub format books, which is not the most most convenient or popular ebook format. A lot true ebook readers supported the .PDF format from the get-go, leaving the iPad without the ability to read the most common ebook form. But now the iPad and the iBook app can view and open .PDF’s with no problem. If you are like most of your ebook collection is in .PDF format, but now they can be added to your iPad’s bookshelf. If you are not a fan of Apple iBook app, there are some top-notch alternatives, the most popular being GoodReader. Another excellent .PDF reader is Fast PDF, which mimics Apple’s bookshelf design. and is probably the fastest .PDF reader available today. Getting back top the iBook update, Apple has also added new bookmarking, passage highlighting, and note taking features. Users can take notes and bookmark specific passages of a book and have them synced wirelessly between all your iDevices. You can also open and read PDF documents from Mail, and save them to your library. 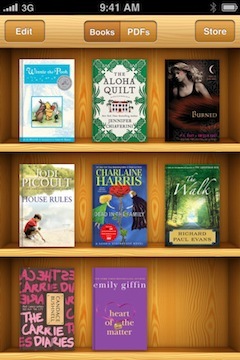 All are very nice features, and will make the iPad an even better ebook reader! From what I can tell, my all PDF ebooks seem to work well in the iBook app, some heavy graphics within the PDF are so clear, and certain books have blank book-covers. For the most part, you can add cover artwork of your choosing, so your bookshelf will look complete and detailed, just like if bookstore purchases. Those interested in the update can get it now through the App Store, you will need iOS4 on your iPhone or iPod Touch to use the new update, iPad owners can simply update the app now.